The Gulf Coast is a fantastic area, renowned for its beauty, but more importantly the catch that lies beneath the water. Before you get on that charter boat for a fishing experience in paradise, here are some tips for successful angling on the Gulf Coast. First you should be able to become one with nature as possible. Understanding that philosophy may sound corny to some, but those that understand what is meant by this, have never taken it for granted. Becoming one with nature deals with knowing your surroundings and what they mean for you. If you were to see birds, like gulls hovering over a particular area in the ocean, that area of water in the Gulf Coast will more than likely contain smaller fish, which is a sure sign that there are larger fish nearby. When you are fishing in the Gulf Coast for a specific type of fish like Tuna, spotting a dolphin around is a good sign since they tend to school together, but remember that dolphins are protected so you must be careful! One of the best places to fish on the Gulf Coast is near a reef ecosystem. Why? It could not be simpler; within the reef ecosystem there are numerous smaller fish that inhabit the area and these smaller fish are food for the larger fish. Find out where their food is and you’ll find your target fish. Lastly you should make sure that you are out with an expert, and with Bout Time Charters you will not have to worry about this because your captain, Brett Tennant, will be there with you throughout the entire trip, to help guide you and lead you to one of the best catches of your life. 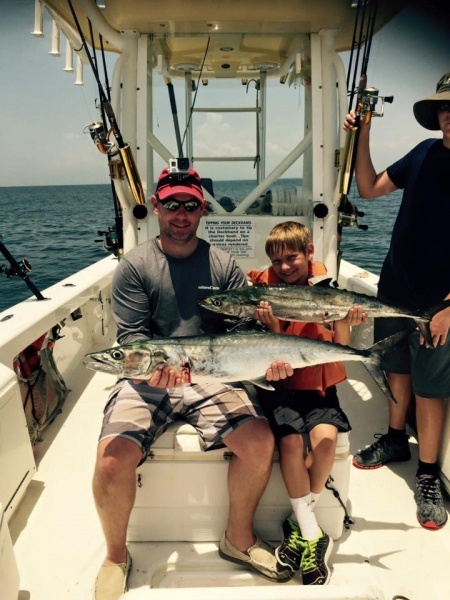 When booking a trip with Bout Time Charters you are greeted by Brett Tennant, who has over twenty years of deep sea fishing knowledge of the Pensacola area. At Bout Time Charters you will be on one of the best charter trips in the Pensacola area. Isn’t it ‘bout time you contacted us for a charter tour on the Gulf Coast of Florida?